T.S.I. tube monitoring constantly lets you know that your power tubes are in good shape, and if not, which ones need to be replaced. The back panel of the 6505 MH is full of modern technology, including Peavey's exclusive MSDI output, USB recording output, headphone output, speaker defeat switch, plus a built-in power attenuator! 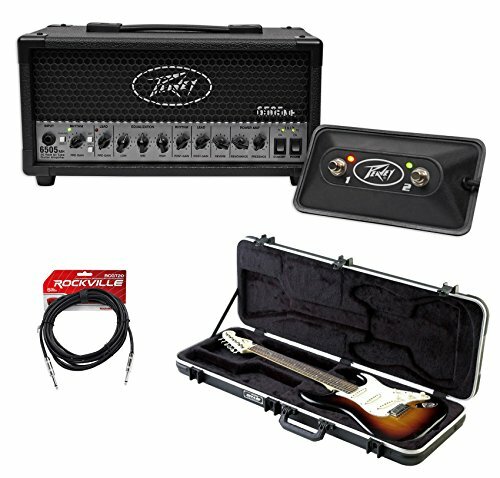 Package Includes: (1) Peavey 6505 MH 20 Watt 2-Channel Micro Tube Guitar Amplifier Head, 3-Band EQ. (1) SKB 1SKB-66 Electric Hard-Shell Guitar Rectangular Case. (1) Rockville RCGT20B 20' 1/4'' TS to 1/4'' TS Instrument Cable-Black 100% Copper. Peavey 6505 MH 20 Watt 2-Channel Micro Tube Guitar Amplifier Head, 3-Band EQ. 2x EL84 power tubes and 3x12AX7/ECC83 preamp tubes. Two footswitchable channels with 3-band EQ. Footswitchable crunch on Rhythm channel. Footswitchable reverb. Footswitchable buffered effects loop. Tube Status indication (T.S.I.) circuit. MSDI Output with XLR and ground lift switch. USB output. Speaker defeat switch. Headphone output. Attenuator switch for 20 watts, 5 watts, or 1 watt output power. Footswitch included. Patented Fiberglass reinforced nylon trigger release latching system . TSA recognized and accepted locks . Bumper protected valance . Contoured exterior with stacking points. Injection molded feet . Indestructible cushioned rubber over-molded handle . Full length neck support. Rigid EPS foam interiors with plush coverning to keep guitar from slipping . Accessories compartment. .
Rockville RCGT20 1/4'' TS to 1/4'' TS Guitar / Instrument Cable. 24 AWG 100% Copper Conductors for Enhanced Signal Clarity. Nickel Plated, 1/4" Straight-to-Same Connectors. High Density 90% Coverage OFC Braid Shield for Superior EMI and RFI rejection. Length: 20 Ft. Color: Black. . If you have any questions about this product by Peavey, contact us by completing and submitting the form below. If you are looking for a specif part number, please include it with your message.